Because I don't use 'normal' conditioners, I'm always looking for new natural products to try out to keep my hair looking healthy and stop it becoming too dry or damaged. 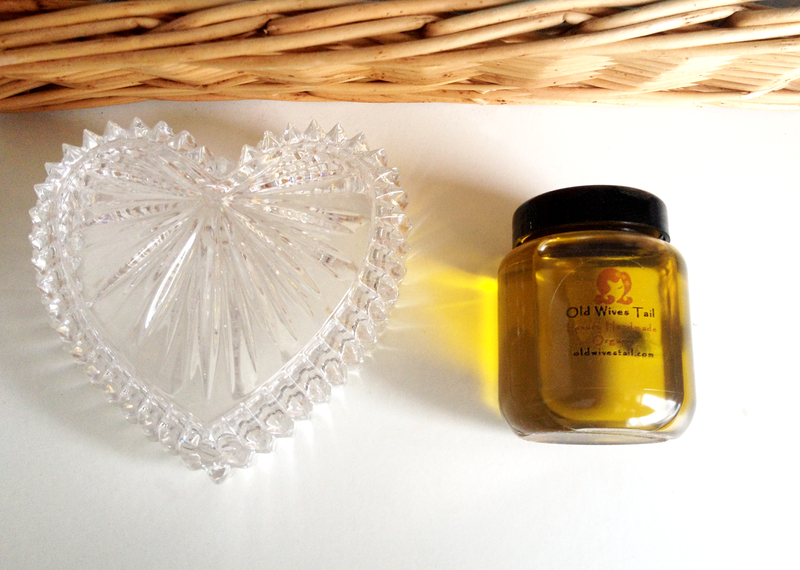 So, when I was asked if I wanted to try an organic oil treatment from Old Wives Tail, I couldn't refuse! 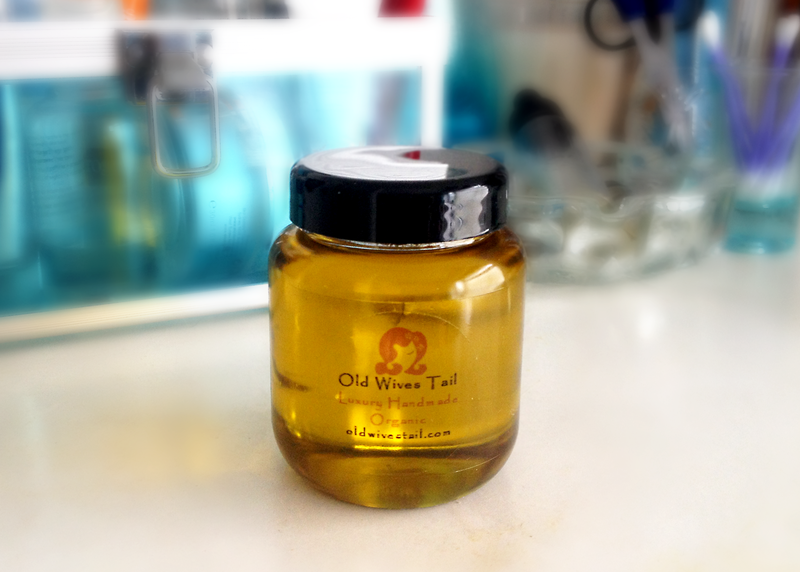 Old Wives Tail gets its name from a Portuguese grandmother who had a secret recipe for a treatment that would leave hair soft and silky, which she passed down to her granddaughter who now shares the secret (or at least the products made from the secret) with the rest of us. The grandmother is the old wife, and the tail is the long silky hair, a pretty nifty idea for a name I think! I was sent the Melado Organic Hair Oil treatment to review, which sells for £13.99 for a 100ml pot. The treatment is handmade from a blend of four oils, including Argan and Almond which are a couple of the most well known for hair and body treatments. On first opening the pot to have a sniff, I was amazed at how the product smells- it has a very strong scent of lavender, but not that fake lavender that tries feebly to make your clothes drawer smell nice or send you off to sleep, a real woody lavender that smells exactly the bushes I used to have in my garden. 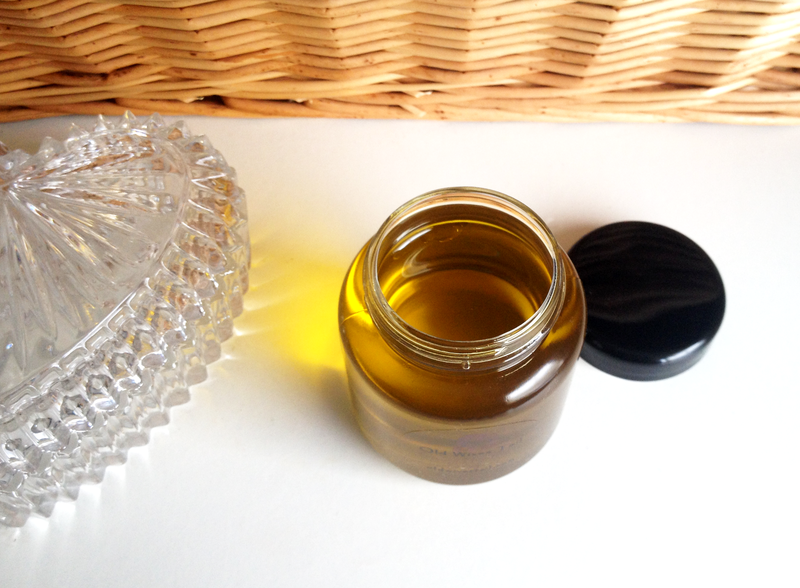 The treatment also contains Olive oil but is much less thick than you'd expect, and it has a lovely bright amber colour. On the first try I wasn't quite sure how much of the oil to use on my hair, as the directions just state to massage into damp hair weekly. I've found dipping my finger into the pot and rubbing into my palm about 5 times gives me an amount that will coat my hair and make it feel that it has treatment in it without turning it into a dangerously dripping oil slick. The oil is said to penetrate the hair roots and strengthen the follicle to encourage hair growth when massaged into the scalp. I must admit that I've only tried this once as I don't have much trouble growing my hair and its always been incurably greasy, but on the time I did try my hair was super-shiny afterwards. So on to the results- has this treatment actually done anything for the long lengths and ends of my hair that I sometimes describe as pretty straw-like? Well, in short, yes! As a weekly product I was expecting the oil to take a while to work, but I saw results from the first use and I was pretty impressed. After applying the oil from my ears down, wrapping my hair in cling film and clipping it to my head for an hour, I was really surprised to find just how soft and shiny it was after washing. Occasionally it needs more than one shampooing to remove the product completely, but usually it takes a couple of weeks of using something daily for it to have much of an effect on my hair so I was pretty thrilled to see my hair shining from root to tip! I've been using the Melado Oil weekly for about 2 months and it barely looks like I've used anything from the pot, so I reckon this will last for ages. As I've said I can't vouch for its hair growing abilities, but the amazing scent and the way it will make your hair look and feel means it's definitely worth a purchase. Is it time to ditch your daily chemical filled conditioner and turn to a weekly organic treatment? In the case of Old Wives Tail Melado Hair Growth Oil, definitely!